Peripheral nervous system (PNS) is the part of the nervous system in vertebrate animals that lies outside of the brain and spinal cord (central nervous system). It includes the nerves that extend to the limbs and many sense organs. 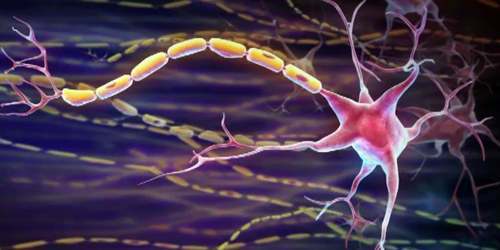 It contains all the nerves in the body that lie outside of the spinal cord and brain. These two systems communicate with each other to make sure our body parts, such as our fingers, can send signals to the central nervous system for processing in our brains. The CNS (central nervous system) is composed of the brain and spinal cord, which function to receive, process, and send information to the PNS. The PNS consists of cranial nerves, spinal nerves, and billions of sensory and motor neurons. The main function of the PNS is to connect the CNS to the limbs and organs, essentially serving as a relay between the brain and spinal cord and the rest of the body. Unlike the CNS, the PNS is not protected by the vertebral column and skull, or by the blood–brain barrier, which leaves it exposed to toxins and mechanical injuries. There are two types of cells in the peripheral nervous system. These cells carry information to (sensory nervous cells) and from (motor nervous cells) the central nervous system. Cells of the sensory nervous system send information to the CNS from internal organs or from external stimuli. Motor nervous system cells carry information from the CNS to organs, muscles, and glands. The sensory (afferent) division carries sensory signals by way of afferent nerve fibers from receptors in the central nervous system (CNS). It can be further subdivided into somatic and visceral divisions. The somatic sensory division carries signals from receptors in the skin, muscles, bones and joints. The visceral sensory division carries signals mainly from the viscera of the thoracic and abdominal cavities. The motor (efferent) division carries motor signals by way of efferent nerve fibers from the CNS to effectors (mainly glands and muscles). It can be further subdivided into somatic and visceral divisions. The somatic motor division carries signals to the skeletal muscles. The visceral motor division, also known as the autonomic nervous system, carries signals to glands, cardiac muscle, and smooth muscle. It can be further divided into the sympathetic and parasympathetic divisions. The peripheral nervous system is divided into the somatic nervous system, and the autonomic nervous system. The somatic nervous system is under voluntary control, and transmits signals from the brain to end organs such as muscles. 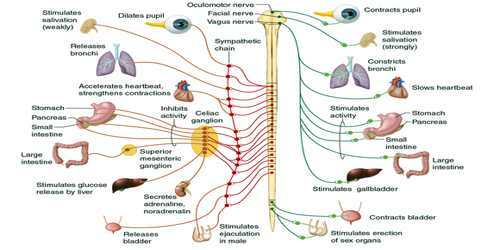 The sensory nervous system is part of the somatic nervous system and transmits signals from senses such as taste and touch to the spinal cord and brain. The autonomic nervous system is a ‘self-regulating’ system which influences the function of organs outside of voluntary control, such as the heart rate, or the functions of the digestive system. Nerve fibers of the PNS are classified according to their involvement in motor or sensory, somatic or visceral pathways. Mixed nerves contain both motor and sensory fibers. Sensory nerves contain mostly sensory fibers; they are less common and include the optic and olfactory nerves. A nerve is an organ composed of multiple nerve fibers bound together by sheaths of connective tissue and a ganglion is a cluster of neuron cell bodies enveloped in an epineurium continuous with that of a nerve. 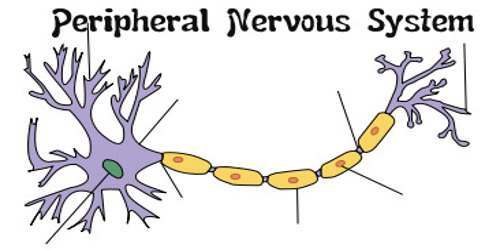 Peripheral nervous system connections with various organs and structures of the body are established through cranial nerves and spinal nerves. There are 12 pairs of cranial nerves in the brain that establish connections in the head and upper body, while 31 pairs of spinal nerves do the same for the rest of the body. While some cranial nerves contain only sensory neurons, most cranial nerves and all spinal nerves contain both motor and sensory neurons.